Two masked gunmen kidnapped a bank manager, strapped with what they said was a bomb to her midsection and forced her to order employees to empty cash drawers when her Bank of America branch opened the morning of Wednesday September 5, authorities said. The bank robbers got away with an undisclosed amount of money, but no one was injured in the heist. A Los Angeles County sheriff's bomb squad disabled the device, but investigators wouldn’t say if it was explosive. The robbery occurred shortly after 8:30 a.m. after the bank manager, told authorities she had been held against her will since Tuesday night. The bank manager arrived at her workplace wearing a device placed on her stomach by the suspects, authorities said. The woman then ordered her fellow employees to remove the cash from the bank and it was thrown to the suspects who were waiting outside, authorities said. The two men, who were armed with handguns and wore ski masks, took off in a two-door car, possibly a Kia, and remain at large. 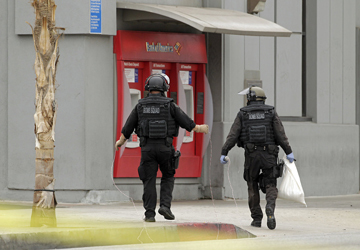 Parker said the woman remained inside the bank until a bomb squad arrived and removed the device from her body. The bomb squad later disabled the item with a robot. It’s unclear if the woman knew the suspects.